"With all the determination and perseverance of the dedicated cold case detective, Jerry Lobdill has uncovered and brought into bright light a long ignored criminal conspiracy, and produced an excellent work and a fascinating read. " "Strange things happen in court rooms today, but it is doubtful if what happened in the El Paso court rooms in 1918 could possibly happen today. Jerry J. Lobdill has, after years of research, provided us with an exceptional treatment of a murder for hire, the investigation, the trial and the outcome. The victim was Thomas Lyons, owner of the largest ranch in the United States at the time. All that is certain is that he was murdered, but who all were involved in his death? Who was the actual "hit man?" Why was he killed? Who all did benefit from his death? Was it a simple revenge killing or were there much larger forces at work, such as international intrigue with participants in the Mexican Revolution? One who is today familiar with crime dramas on TV may wonder how such a miscarriage of justice could occur in our United States. Lobdill presents convincingly what happened and why. " " "The evil that men do lives after them." If author Jerry Lobdill is right, Mark Antony's reflection on the assassinated Julius Caesar, courtesy of William Shakespeare, applies equally to Old West hired assassin Jim Miller. In Last Train to El Paso, Lobdill tells the fascinating story of a once sensational but long-forgotten west Texas murder that ended in a court-approved miscarriage of justice. In a narrative based on surviving court records, newspaper accounts, and private documents not intended for daylight, Lobdill makes a strong case that, nearly a decade after the vigilante hanging of "Killer Miller", the feared assassin's tactics were used by surviving criminal associates to intimidate El Paso's officers of the court into burying the murder of a New Mexico cattle king. " 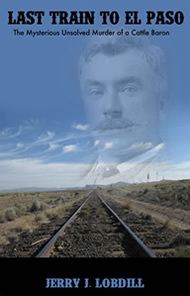 "In Last Train to El Paso, Jerry Lobdill has uncovered a long forgotten but important episode in Western history: the 1917 El Paso murder of New Mexico cattle baron Thomas Lyons. This killing, and the legal proceedings which followed, mark plainly the end of the gunfighter era in El Paso. Lobdill shows that Lyons' murderers had been confederates of the notorious killer-for-hire Jim Miller, whose bloody career ended on a lynch rope in 1909. This is an exhaustively researched book which opens a window into the final years of the Wild West."